Star Trek Neck Tie for any occasion! Matched with archived and preserved fabric swatches from 1969. Created from remaining fabric of high end replica tunic and dress lines! 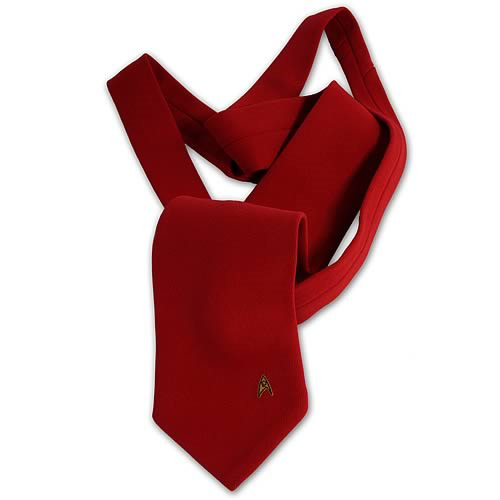 Constructed by the same production team who worked on Star Trek XI, the Star Trek Costume Fabric Red Neck Tie was created from the remaining fabric of the high end replica tunic and dress lines so every fan can own a piece of this uniquely created fabric, for whatever occasion. Each fabric color has been matched with archived and preserved fabric swatches from 1969. Small Enterprise delta shield emblems signifying the various divisions within Starfleet are located toward the bottom on the right side: the Command Division Emblem for those wearing gold uniforms like Kirk, Sulu, and Chekov; the Science Division Emblem worn by Spock and McCoy, as well as those in blue uniforms; and the Services Division Emblem as worn by Scotty and Uhura, as well as the various engineers, security officers, and technical staff who wore red.